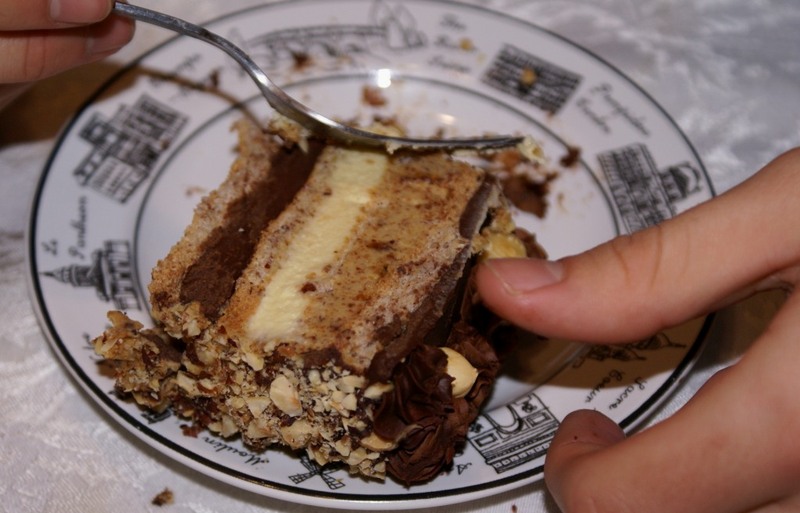 The first time I tried Marjolaine cake was at our local Italian bakery. A French cake in an Italian bakery! There is no way that you could find that in Italy! 😉 Anyway, the last few years the bakery has not been making it anymore and few days ago I think I found a reason why! Since this is my son’s favorite cake and I was not able to buy it anywhere, I decided to surprise him and make it for his birthday. I googled the recipe and found about 5 different versions. I chose the one that in my opinion was best “resembling” the original from our favorite bakery. Should I say that it took me 5 hours to make this cake?! 🙂 No wonder the bakery is not taking that kind of time! The cake turned out perfect and it tasted s-u-p-e-r-b! My son was very happy! His first slice was as thick as 3 regular slices! 🙂 Marjolaine cake is now on my Special Occasion Cakes list! A lot of work was put into it, A LOT, but in the end it was well worth it! Preheat the oven to 300 degrees. Oil a baking sheet with a light vegetable oil. Spread the almonds on another baking sheet and bake until fragrant and light brown, about 10 minutes. Remove from oven and let cool. Combine the nuts and sugar in a heavy-bottomed saucepan. Cook, stirring constantly, over medium heat until the sugar begins to melt. The mixture will go through several stages,from a dry blend to one where the sugar forms little bubbles the size of peas. Continue cooking, stirring constantly so all of the sugar clinging to the almonds melts, until the mixture turns dark brown and syrupy and the nuts make a popping sound. The whole process will take about five minutes. 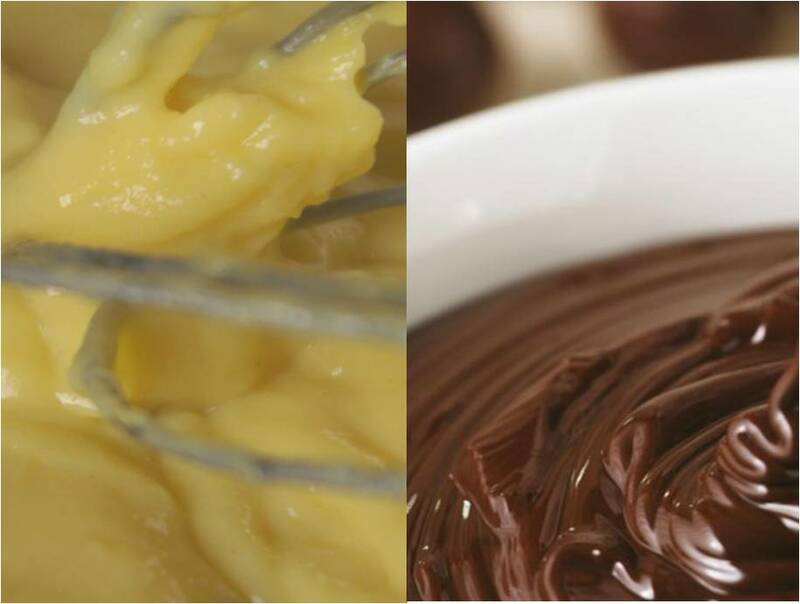 Using a whisk or electric mixer, beat the egg yolks and sugar in a mixing bowl until thick and lemon-colored. Gently whisk in the flour. Heat the milk to a boil in a large heavy-bottomed saucepan. Whisk one-third of the hot milk into the egg mixture, then pour the egg mixture into the remaining milk. Boil, stirring constantly, over medium-high heat until thickened, about two minutes. Transfer to a bowl and let cool. Preheat the oven to 300 degrees. Heavily butter two jelly-roll pans, measuring about 14x10x1 in. Line them with parchment paper and butter and flour the paper. Spread the hazelnuts on a baking sheet and roast until fragrant and lightly browned, about 10 minutes. 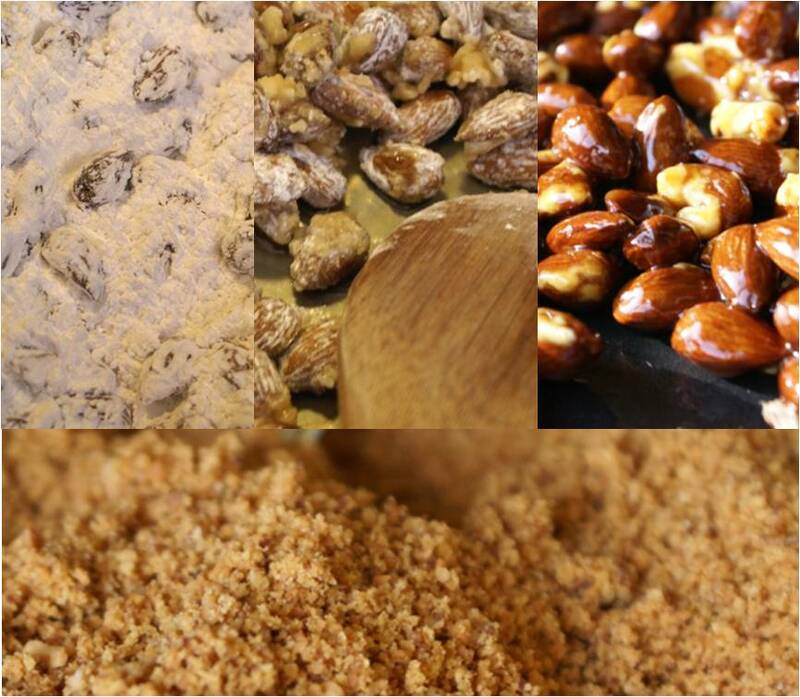 Remove from the oven and rub the warm nuts in a cotton dish towel to remove as much skin as possible. Cool, then grind them with a quarter cup of the sugar in a food processor. Using a whisk or electric mixer, beat the egg whites until they begin to stiffen. Slowly add the remaining sugar, mixing until stiff but not dry. Fold in the flour and hazelnut mixture. Spread the batter evenly in the prepared pans. Bake until the cakes are thoroughly browned, 25 to 30 minutes. Remove the cakes from the oven and invert them onto racks to cool, paper side up. Cover the cakes with a damp towel for several minutes, then remove the parchment paper while the cakes are still warm. Let cool completely. Cut each cake lengthwise in half. At least 24 hours, but not more than three days, before serving, assemble the Marjolaine: Divide the pastry cream in half. Blend the vanilla extract and the rum into one portion of the pastry cream. Blend the praline powder into the remaining pastry cream. (Mix the praline cream just before assembling the cake, because the flavor will fade if mixed up in advance.) The chocolate and pastry creams should be chilled, but spreadable. 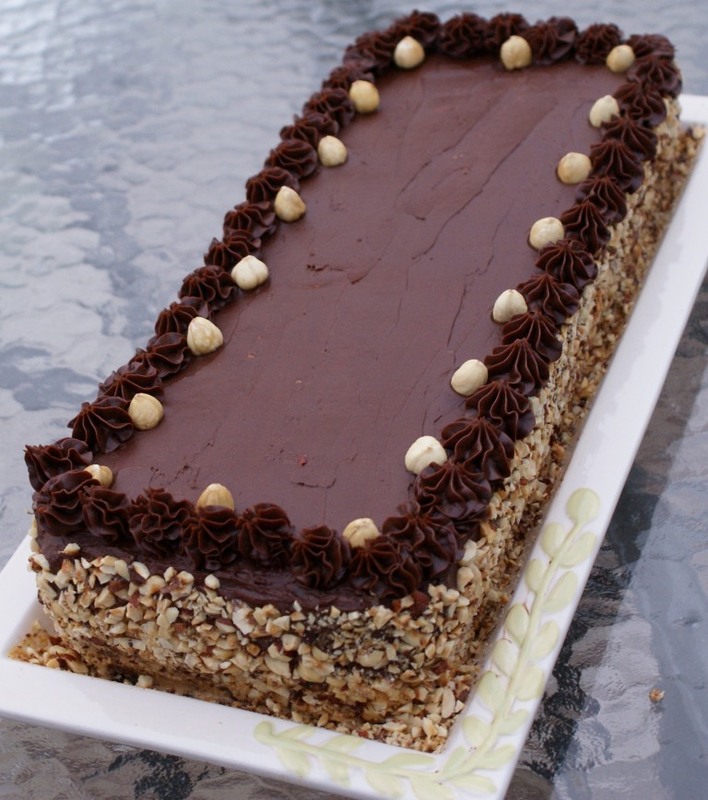 Place one cake layer on a large, rectangular serving platter. Spread half the chocolate cream on the cake. Refrigerate until firm, about 10 minutes. 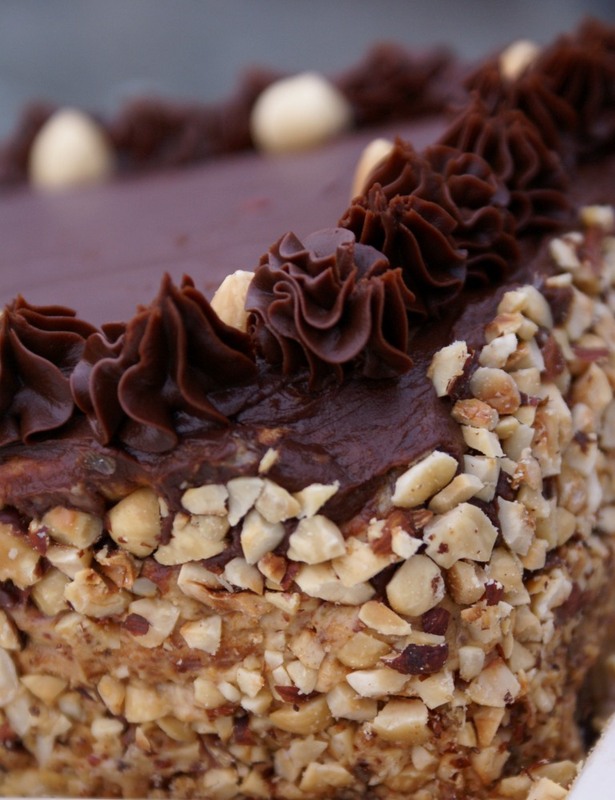 Cover the chocolate cream with a second cake layer. Spread with all of the rum cream and refrigerate until firm, about 15 minutes. Top the rum cream with the third cake layer. Spread with all of the praline cream and refrigerate until firm, about 15 minutes. 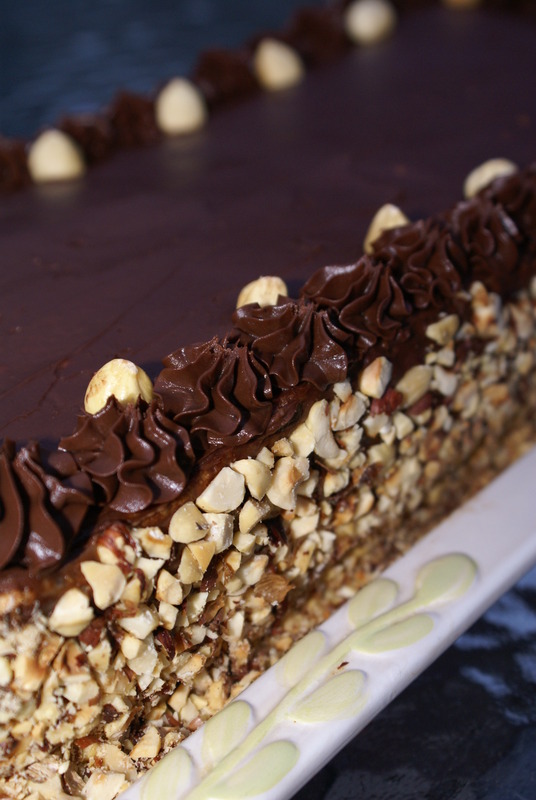 Top the praline cream with the fourth cake layer. Frost the top and sides of the cake with the remaining chocolate cream. Refrigerate uncovered for 15 minutes, then cover with plastic wrap. Refrigerate one to three days before serving. To serve, remove from the refrigerator 15 minutes before cutting, then cut into thin slices. **Original recipe found here (I slightly changed the quantity of some ingredients). < Previous Merry Christmas and Happy Holidays! Looks so good. What a lucky son you have. Happy birthday to him! Thanks so much! 🙂 The smile on his face was priceless! Thank for stopping by! This looks/sounds incredible. It is decorated so beautifully, and the pictures are great! What a perfect celebration cake! Sibella this cake is just beautiful with all the tasty layers. So much effort. Wow, I am so impressed. You have outdone yourself! Thank you so much Bobbi! 🙂 I hope you and your family are doing well! 5 hours or not I will be making this one day! Thanks so much for posting your outrageous baked treats. You are amazing to make this cake. Looks so fantastic! Thank you April! 🙂 Thanks for stopping by! Thank you so much Jasline! 🙂 It’s a 7 layer cake (4 cake layers and 3 layers of frosting). It is time consuming but it truly is a bomb! Thanks for stopping by! This cake look fantastic! I am sure it is divine and it is worth all the effort put into it. Thanks so much! 🙂 Yes, it was definitely worth the time! Thanks for stopping by! Sibella, you are amazing. I think the first thing I do when I see a recipe with 5 sub-recipes is to turn the page. (Wait…this has SIX!). So impressive, a real birthday treat. My husband’s birthday is coming up soon, I better not let him see this post 🙂 Nevjerojatno! Sara, hvala puno! The things we do for our kids, ha! 🙂 I really think it is not as bad as it seems when you take a look at it for the first time…I am sure I will be not making it as often as pita, but I will be making it! Ciao, ciao! Thanks so much! 🙂 I’m glad you have stopped by! This is real temptation, it looks so good, “mouth watering”.!!!!! Thanks so much! 🙂 It is a delicious cake, I think perfect for special occasions! Thanks for the ‘like’ because it led me to this beautiful thing! Must stop typing…. dribbling onto keyboard…..
Haha, you’re welcome! 😀 Thanks so much for visiting! Oh my gosh. Gorgeous! It looks absolutely stunning! I am in total awe.